Gillford Condo is a Bears Den we have the cutest décor with bears everywhere. 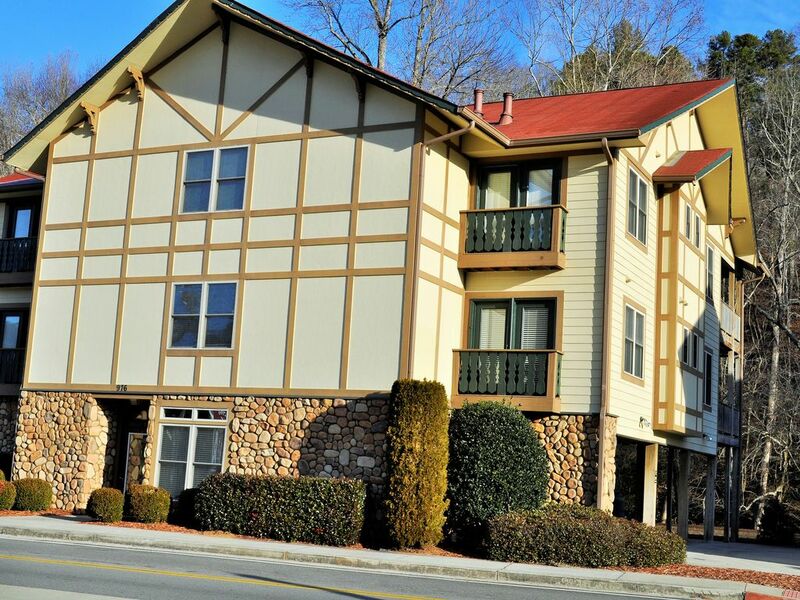 The condo is right on the river, walking distance to all that Helen has to offer. Right next door to the Fest Hall. We have a covered carport no need to unload the car in the rain, when you walk in the lobby there is a elevator with a cart that you can use to unload all your luggage and roll it back in and send it up or you can ride the elevator right to your door. When you walk in the door , you will love the beautiful décor of a cabin comfy feel. The kitchen has granite countertops , stainless steel appliances, and everything you need to cook or entertain. The living room has a comfortable sofa couch that sleeps 2 guest. 2 recliners that faces the gas fireplace with a 42' flat screen to enjoy after a wonderful day in Helen. we have a king bedroom suite with a fireplace and flat screen tv the king bedroom has a door that will take you to the covered porch , the covered porch over looks the river . The master bathroom has a jacuzzi tub , walk in shower. The guest bedroom has a king bed, fireplace , flat screen tv. There is a door that overlooks the street. Right across the street is mini golf , right down the street is the city park , tubing. Rocking chairs on the river. This is our 2nd time staying in this condo and we hope to be back soon. The layout and the bear decorations are perfect. Love the deck overlooking the river.